Founded in 1987 by Stephen Lawrie. 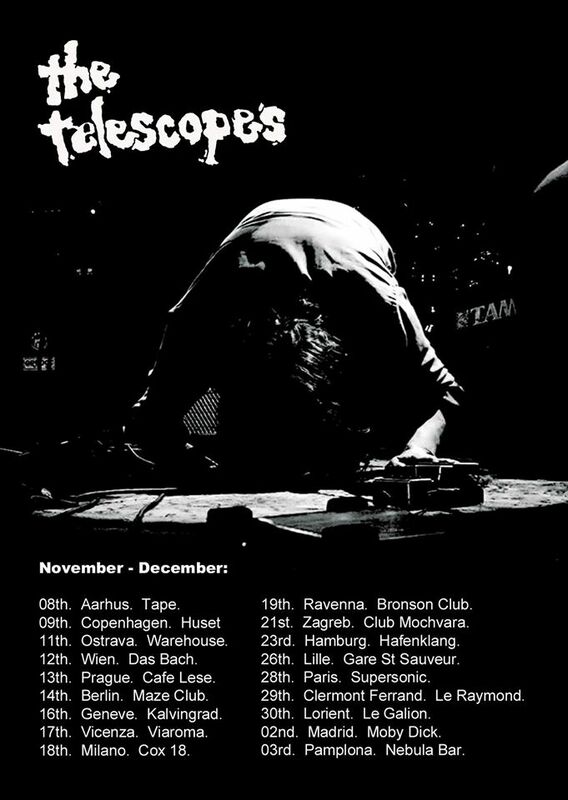 The Telescopes have been mining a unique anti-myopian seam of highly influential experimental, drone, noise, dream & psych for over 20 years. Tours followed with Spacemen 3, Primal Scream and The Jesus and Mary Chain. And it wasn’t long before The Telescopes were headliners themselves. Bark Psychosis, Whipping Boy, Slowdive, Bleach, The Cranes and Ride all played some of their earlier shows supporting them. In 1990 the group appeared at one of the UK’s biggest festivals of the time, The Reading Festival. They were one of the few bands that weren’t bottled off the stage at the event. However, the increasing violent interactions with audiences at their shows saw the group step away from their noise origins and head towards a more introspective psychedelic sound. It was around this time that What Goes On folded and Alan McGee stepped in to release the group’s material from the hands of official receivership. The Wire magazine described them as having “a very real & crazy originality that carries fat tons of wallop” and the NME found them “in another universe altogether, incredible”. Arch drude Julian Cope has also championed two of their releases on his Head Heritage site, referring to their “suspended-in-space magnificence”. Meanwhile, The Telescopes have signed with Hamburg’s Tapete Records. A new album, The Telescopes 9th, is scheduled for release in february of 2017.